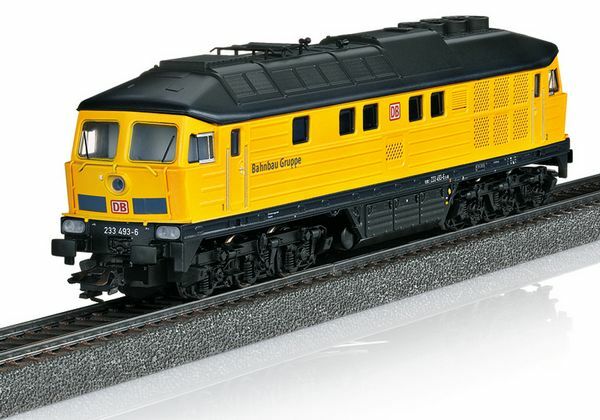 The yellow diesel, road number 233 493, of the DB Bahnbau Gruppe / DB Railroad Construction Group called "Tiger" is a real powerhouse and it is ideally suited to pull the heaviest trains for construction logistics. It belongs to the units of the classes 232/233 popularly dubbed "Ludmilla" by railroad fans. These locomotives had their roots in the "October Revolution" locomotive builder at Luhansk in the Ukraine in the former Soviet Union. In April of 1977, it came as road number 132 493 to the German State Railroad (DR) of the GDR, then came as road number 232 493 to the roster of the German Railroad, Inc. (DB AG), was designated again 233 493 in 2003 after having a new motor installed, and was finally put into storage in April of 2011. At the end of 2014, the DB Bahnbau / DB Railroad Construction had it refurbished and has been using it since then chiefly to haul the heaviest loads. Prototype: DB Maintenance Network, Railroad Construction Group, class 233 "Tiger" heavy diesel locomotive. The locomotive looks as it currently does in real life. Model: The locomotive is constructed of metal. It has an mfx digital decoder and extensive sound functions. The locomotive has exhaust gas emission with a Piezo vaporizer that can be controlled digitally in three steps (operation with distilled water). 4 axles powered. Traction tires. The triple headlights and dual red marker lights change over with the direction of travel, will work in conventional operation, and can be controlled digitally. Maintenance-free, warm white and red LEDs are used for the lighting. Length over the buffers 23.9 cm / 9-3/8". Version with a digitally controlled exhaust/smoke unit based on cold steam. The DB Bahnbau Gruppe GmbH / DB Railroad Construction Group, Inc. as a 100% subsidiary of the DB Netz AG / DB Network is a full-service provider for railroad infrastructure. The spectrum of services includes the categories superstructure, equipment, civil and structural engineering, as well as mechanical engineering. The DB Bahnbau-Gruppe / DB Railroad Construction Group has one of the largest and most unusual machinery rosters in Europe to manage its diverse tasks. On the one side, it focuses on proven technologies, on the other side on the highest of technical standards. Both are indispensable for the efficient execution of infrastructure construction projects for modern networks. Before "operations" at a construction site can be started however, the required machinery and material must first be transported there. 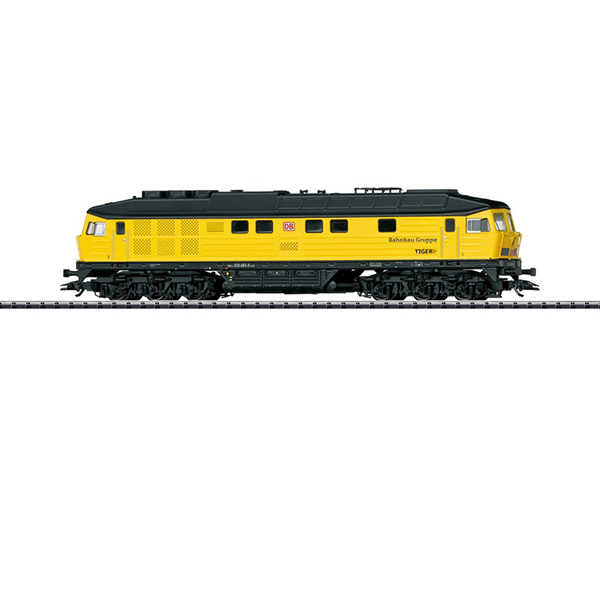 For this the DB Bahnbau / DB Railroad Construction has a whole series of locomotives available and naturally also a very special powerhouse – the yellow "Ludmilla" with the name "Tiger" or simply with the mundane number 233 493. Even the name "Ludmilla" assumes an eastern origin and the roots of road number 233 493 are actually in the former Soviet Union: After the decisions of the Seventh Party Congress of the SED ((Socialist Unity Party of East Germany), the change in motive power in the GDR was to be accelerated significantly. A 3,000 horsepower diesel locomotive was planned for the accelerated replacement of steam locomotives. This unit was built on the good experience with the DR V 200. Between 1973 and 1982, 709 units of the 120 km/h / 75 mph fast class 132 were delivered by the "October Revolution" locomotive builder at Luhansk in the Ukraine. They were powered by a 16-cylinder, four-stroke Kolomna diesel motor with turbocharging and a continuous rating of 2,200 kilowatts / 3,000 horsepower, which provided the necessary drive power by means of a motive power generator to the six DC traction motors connected in series. The drastic decline in freight traffic after the reunification of the two Germanys soon resulted in a large surplus of DR diesel locomotives and many "Ludmillas" (starting in 1992: class 232) thus also disappeared from the rails. In 2002/03, at least 65 units of the class 232 were converted to the class 233. The installation of a new Kolomna type 12D49M diesel motor and a rated output of 2,206 kilowatts / 2,958 horsepower as well as improvements to the cooling system, electrical layout, and the cabs shaped crucial measures. Road number 233 493 was put into storage by the DB AG in April of 2011. Nevertheless DB Bahnbau / DB Railroad Construction had the locomotive refurbished at the end of 2014 and has been using it since then as the "Tiger" in Railroad Construction "yellow" chiefly to haul heavy trains for construction logistics.